Reporting templates are the key to easier to use XBRL-based digital financial reports and usable SEC XBRL financial report information within the EDGAR system. The article on Disclosure Management mentions reporting templates (see page 5). I created a set of 75 reporting templates which I called "disclosure templates". In the past I have referred to these as "exemplars" and "prototypes". Here is a set of 291 SEC XBRL financial reports broken down by component where you can compare how different reporting entities modeled similar pieces of their financial report. In essence the entire SEC EDGAR system is a big set of reporting templates. The AICPA even has a publication, Accounting Trends and Techniques, which is basically reporting templates gleaned from 600 SEC filings printed into a book. ResearchPoint-XBRL from Softpark is held out to be a set of pre-validated templates for creating financial filings to comply with the India Ministry of Corporate Affairs (MCA), they say, "Finally, you can now do MCA filings much faster and without pain." SQLPower says that they also offer reporting templates called "superVision" per a post on LinkedIn. So what exactly is a reporting template and why is it useful? The XBRL Cloud Evidence Package (which I mentioned in another blog post) helps you see what a reporting template is and why they are useful. For example, consider a cash flow statement. 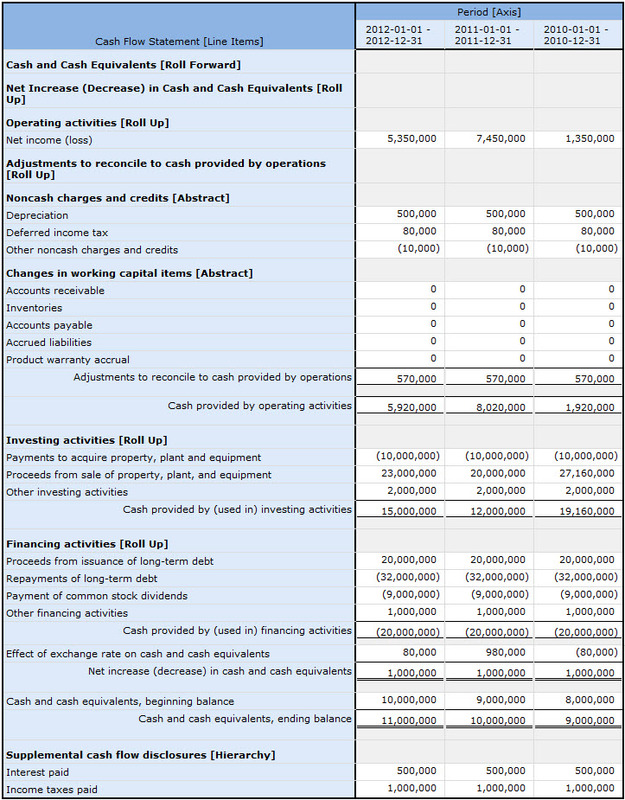 A reporting template is basically a model of the cash flow statement. It includes the rendering, an SEC preview, the model structure, its fact table, all tightly woven together by a set of business rules and general modeling and other verification rules. The rendering is simply the model structure, the fact table, and some rendering algorithms which organizes the information in a manner familiar to accountants and other business users. For example, three periods are shown, each in a column. Pay particular attention to the business rules of the reporting template. Take a close look at the business rules and see that every numeric computation is represented in those rules. The business rules make it impossible to make a mathematical error. In fact, all the automated verification rules are simply information a software application can use to make sure the user of that software cannot do something illogical or illegal. The verification is not done at the end of the process; verification is done throughout the process, by the software, to make sure the business user stays on track. Adding that reporting template to your report creation project. The reporting template is a rock-solid, valid piece of a report...but it is not exactly how you want it. You edit the template, adding additional characteristics that you need, removing the ones you don't, putting the information you want to report into that reporting template. Throughout the process the software keeps everything connected together logically and legally. Accountants use their expertise and judgment to be sure the things that the software cannot check are done correctly. For example, software cannot tell you if you picked exactly the right concept. The software can help you make sure you did not pick the wrong concept though. Say you put an income statement concept on the balance sheet; lots of ways the software can help you realize that you made a mistake. Just like Microsoft PowerPoint helps you drag shapes and other objects into your presentation or Microsoft Visio helps you create a nice drawing, both using templates; reporting templates help your disclosure management software help you create great financial reports. All this may be hard to believe, but if you think about it you will see that it makes sense. Disclosure management software works with pieces of information, weaving them together how you want them weaved together. Call it "structured authoring" or "model-based authoring" or "semantic authoring" or digital financial reporting or disclosure management. They are all really the same thing. I predict you will start seeing disclosure management software which works in this manner within twelve months. Then, the new paradigm of financial reporting will really take off. These reporting templates will also contribute to the quality of the SEC XBRL financial filings in the SEC EDGAR system. Clearly if the reported information is better, the XBRL in the SEC EDGAR system will improve. The better the business rules, the better the information in those SEC XBRL financial filings. Do you think I am dreaming? Do you have other ideas? Leave a comment.